We bought our house from an elderly woman who lived here for years and years. We are really lucky because she loved her home and spared no expense when making updates. There are a few things we could do if we really cared, but, honestly, the house is completely move-in ready and comfortable the way it is. The first thing we did, though, was take out the acoustic (a.k.a. popcorn) ceilings. Our new house is actually 45 years old, so, you know, it’s got some 45-year-old features. We had the ceilings done before we moved in since it’s pretty messy. For the most part it was an easy process and not too expensive, although we have to keep calling the ceiling guy back to fix bubbling spots he missed. I pray I never have to do any real construction because, holy smokes, there is always something with those guys! We hardly did any work and still…I can’t even imagine doing a big project! Anyway, back to the woman who owned our house. She remodeled the kitchen about 10 years ago and, while I may have picked different colors, she did a really nice job and everything is very neutral and high quality. The kitchen is great and I have been reeeeeeallllly happy using it! We have some appliance updating to do (more on that in future blog posts! ), but other than that, I am loving the kitchen. I do need to take a moment, however, to introduce you to my granite countertops. My new counters have a very special talent: camouflage. I’m not exaggerating when I say you absolutely cannot see ANYTHING on the counter surface. No matter what color the debris or crumbs, light or dark, it all just blends in. Even when you look closely. It’s almost magical. The jury is still out on whether or not camo counters are a good thing. On the plus-side, they always look clean no matter what is going on. Big bonus! On the minus-side, they always look clean no matter what is going on. I mean, I could live in absolute squalor and never know it. (Well, unless I touched them!) Does anyone else have camo counters? Should I be grateful for them or curse their existence? I can’t decide! Regardless of the camouflage abilities, I am just so happy the counters are not tile. Tile counters NEVER look clean and the last 6 months with tile was just one constant battle with crumbs. I will never voluntarily get tile counters. EVER. My mother-in-law is getting Wilsonart HD counters installed at her home very soon. I’ll definitely report back on how those turn out and how we all like them! They are definitely more affordable than something like granite, and they have a lot of great features. Eventually we want to put some hardwood floors in the living room, dining area and hallway. If anyone has advice or products they liked for putting in hard floors, please share! Last year for SocialLuxe Lounge, Bissell was one of our platinum sponsors, sharing the Spot Bot deep cleaner with the bloggers at the party. I received a Spot Bot for free, which I was super excited about. But then we didn’t really live in places where I could use it. Until now! Hello, white carpets! Meet the Spot Bot! For real, I love this thing. It’s super easy to use and it does a great job getting the spots and stains out of the carpet. Once I got started, I became a stain-fighting fanatic. I had to stop myself from doing the whole house so I could get other tasks done! I need to go get cooking in my new kitchen! We are doing a small housewarming-and-happy-birthday-Nate party tonight – our first party in the new house! Wish me luck! We’re in a rental home right now and I have to tell you that your camo counters certainly beat my teal formica ones. Not teal formica in a cool vintage way- unless you’re 22 and you think the late eighties constitute cool vintage. Oh also, we have carpets too (EEK) and I also have a spot bot which I totally love. I had camo counter tops at one point too and I absolutely LOVED them. I just made a point to wipe down the counters in a very regimented way – with strokes over lapping one another to make sure I got it all. But that is a breeze compared to tile! We currently have tile floors and counters and they both drive me NUTS. HATE them, yes hate! Nothing is ever easy to wipe up. I have to use a concoction of oxygen bleach powder and water to make a paste just to de-stain the grout. It’s a pain! If we buy this house I will be replacing all tile immediately with pergola flooring and something similar to the granite look-alike counter tops! I feel ya! We have camouflage countertops too. I have a love/hate relationship with them. I love that they don’t look dirty, but I also feel like they’re never really clean because maybe I just think they’re clean, but really they’re just hiding it well. But they’re definitely way better than tile or most formicas. We also have carpet under the kitchen table with young children and I HATE it. What was the builder thinking? We use splat mats (http://www.amazon.com/Jeep-90130-Protective-Floor-Mat/dp/B001IYQ7QS/ref=sr_1_1?ie=UTF8&qid=1373649666&sr=8-1&keywords=jeep+splat+mat) under the table. They aren’t very pretty, but they have saved my carpet from many spills and stains. I take them away when we have company over. We also plan to do some wood floors eventually when time and money permit. We have camo countertops too, but I hate them. Looking down at them I think they are clean, then I look at a different angle (usually after company has arrived) and I see crumbs that I’ve missed. This is our first time with granite too. I’m not a huge fan because they always seem streaky. Any suggestions on cleaners that don’t streak? We do have wood floors in the kitchen and love them! The cleaner that I found works the best is made by Dupont and is called Granite &Marble cleaner &protector. It has a built in sealer. I found this at Lowes in the tile department. I too have camo counters and am not a fan of them. It embarassing to complain about expensive granite countertops but wow are they hard to keep clean. Also, beware of the cleaners you use. They work nicely but make the counter top very slick and items have a way of sliding off. 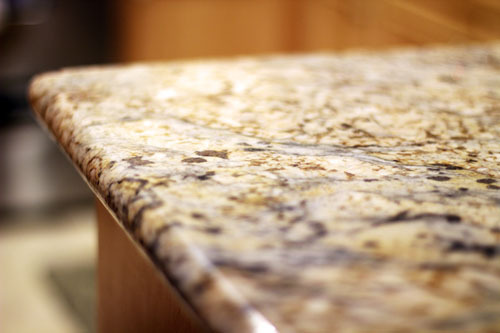 I also have camo countertops – I think they are called Corian??? They are an olive green/black/beige combo. Not my favorite but I can live with them until we get Quartz or Granite. We have a cool, old, 1912 oak kitchen (very different than 1990 oak) which we want to add slate countertops too soon and restore the wood floor….I am in research mode now and am enjoying this thread. We renovated the bathroom and installed a granite vanity which I find difficult to keep clean. Everything seems to leave a mark behind….even plain water. I travel for business a lot and stay in hotels with camo granite countertops in the bathrooms and now I am totally freaked out at the thought of what housekeeping might “miss”. I travel with a little portable pack of Clorox cleanup wipes…I think I will start using them on the hotel camp countertops! 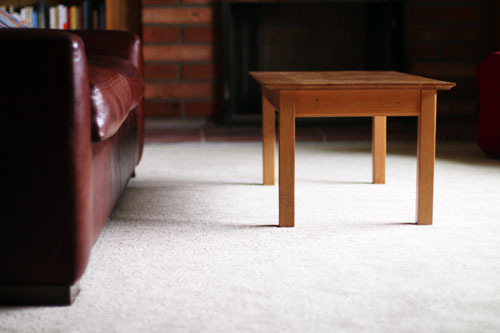 You can put rugs down on your carpets to save them. We ran into similar issues with our dogs and then later our kids. I definitely recommend putting one under your dining tables, and make sure you have a liner if you want to save the carpet. With kids you just look for cheap rugs (Overstock/Tuesday Morning/Costco/Sam’s) because you are going to be changing them out a lot. Oh man! We have very light carpet as well (it was put in by the previous owner – an older widow) and it’s in the dining room. After 5 years and 3 kids it is absolutely destroyed. I can’t wait to get t replaced! I have the same granite in my kitchen. I like the camo quality EXCEPT that it camouflages things too well…meaning the hubby fails to see any of the crumbs he leaves behind! I knew my soon-to-be mother-in-law and I were going to have issues when she came for dinner at our apartment and I mentioned that I had so much trouble keeping the (camo) counters clean because I couldn’t see anything on them and she said “oh, *I* can see a bunch of stuff ”” there, and there, oh and there too. That over there is definitely not from tonight.” Yeah, jeez. Anyway, a suggestion for your carpet issue in case the timeline for the wood floors seems to stretch farther and farther into the future: you can buy sheet laminate cut to whatever size you need (at Home Depot, for instance) and paint it with a cool design, or just plain, whatever you like. Then put a really heavy coat of polyurethane over the top. It makes a very lovely moppable “rug” that you can put over the carpet, at least in the dining room that you don’t have to worry about tossing once you remodel. The one I had in my apartment years ago probably cost be $30 to make, including the paint. Good luck! We lived in a house last year that had black/white camp counters. I grew to dislike them overall. Primarily because I could never tell if they were clean or not and it just left me with a yucky feeling. Also, I inevitably seemed to be setting things down on sticky/wet areas that I didn’t see where there. It just got annoying after a while. I have REAL camo countertops. Advantage Timber. I love them. THey are unique and a real conversation starter. THey look good with my hickory cabinets and white cooking cabinet. I thought it would make the small kitchen look small, but with the light cabinets white stove and fridge–I think it looks great. I love them. that is awesome – love it!